The Hanford Nuclear Facility pictured above had its origins during World War II as part of the Manhattan Project, the United States effort to build an atomic bomb. The reactors at this isolated site in south central Washington state were built to produce plutonium for the bomb that was first tested in New Mexico and that used against the Japanese at Nagasaki in August 1945. The government's work was conducted in secret. Development of the site and subsequent work required the removal of the area's sparse population of ranchers and farmers and the construction of a small city for the workers at the site. The success of the project at Hanford - as well as those at Los Alamos, New Mexico and Oak Ridge, Tennessee - came with a price, though. Radioactive gases blew from the reactor stacks and water containing radioactive materials flowed back into the Columbia River after cooling the reactor cores and seeped from various sources into the Hanford soils. Studying the effects of this contamination is the focus of the concluding activities in this unit. 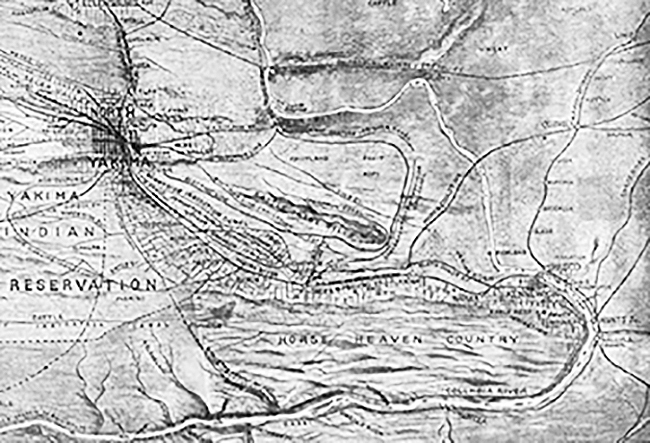 Start, though, by examining the physical and cultural geography of the region as portrayed in the 1907 map below. The Hanford Reach is the region north and west of the city of Kennewick, Washington bounded by the Columbia and Yakima Rivers. The early map linkied at the right provides a rich picture of both the physical and cultural geography of Hanford and the surrounding area in 1907. 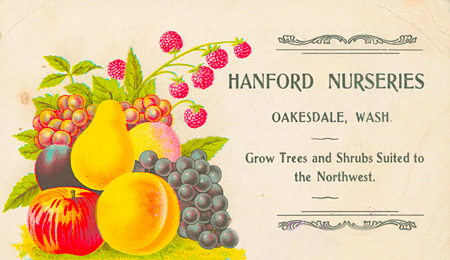 1) Agriculture was the lure that drew settlers to the Hanford area. Identify as many different crops that were grown in the region according the information in the map. 2) What transportation options were there for Hanford farmers? 3) Identify and describe the irrigation sources available to Hanford farmers. 4) What was the source of electric power for the region?